The body and leg of a winged-lion support carved from a rectangular backing decorated with curling vine stems, sprays, and foliage near the base; on the inside (?) below a bracket socket a goat prances or springs at another goat (now lost) in the enrichment. (For this detail in its original state, compare the trapezephoros [table leg] fragment in Naples1). From the height this is probably at least part of one support for a table rather than for a marble seat as Michaelis supposed. The piece, as the incomplete ornament shows, is only partially preserved with the back fracture squared and smoothed as in a similar, less ornate fragment in Berlin from Athens2 which is described as good work in the character of the Hellenistic period. This Soane example is probably later, perhaps, judging from the ornateness, shadowing, and touch of drill, Flavian (69-100 AD). There is a pair of these table supports, of lesser craftsmanship, at St John Lateran in Rome (no.325) in use much as they must have appeared when set up in ancient times, and another example, of markedly inferior quality, employed as a table support to the ticket taker's stand at the entrance to the Museo delle Terme, Rome. A well known example, contemporary with the Soane fragment and in excellent preservation, is the ensemble from the Cartibulum of Cornelius Rufus at Pompeii3. Of all the table supports of this general class and of an early Imperial date, perhaps the most beautiful complete example is the little-known pair supporting the table of the side altar in S. Tommaso di Cenci, Rome. Again their four heads are in the form of horned lions, a derivation, according to Giglioli, from Near Eastern into Hellenistic art4. An overall picture of the development and styles of Hellenistic and Roman tables is presented by G.M.A. Richter in his Roman Furniture5. 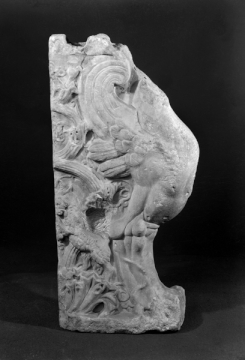 The marble table support in the Vatican6 recalls the Soane fragment in the imaginative enrichment of the surface between the seated or partially represented animals - two griffins seated back to back. The table supports from the house of Cornelius Rufus and several even more elaborate examples, including one with Scylla and an Eros-on-Centaur group, all either in Naples or from Pompeii, are reproduced in full page plates in Spinazzola7. The motive was very popular in Neoclassical as well as Hellenistic and Roman architecture and is found in some curious locations: for example four pairs form the decorative divisions in the attic of the triumphal façade of the Galleria Nazionale d'Arte Moderna, Rome, dedicated in 1911. The 'antique table-leg' motive also occurs frequently as the enframement for ancient relief panels inserted above the doors in the upstairs salons of the Villa Albani-Torlonia8. As a bridge between the late antique and later periods, an interesting use of the winged lion and paw motive can be found on the Roman (?) keystones set over the antique columns of the portico of SS. Giovanni e Paolo on the Celian Hill, Rome. Robert Cohon of New York University wrote to Sir John Soane's Museum in December 1980, stating his view that this piece is 'definitely not Italian workmanship' but probably late Hellenistic work, by a Greek carver working in Campania. 1 Museo Borbonico, VII, pl. XXVIII. 2 Königliche Museen zu Berlin, Beschreibung der antiken Skulpturen, Berlin, 1891, p. 428, no. 1087. 3 P. Gusman, Pompei: The City, its Life and Art, trans. F. Simmonds and M. Jourdain, London, 1900, p. 397, also the table p. 396. 4 Bullettino della Commissione Archeologica Comunale di Roma LXXII (1946-48), 1949, p. 49ff. 5 G.M.A. Richter, Ancient Furniture: a History of Greek, Etruscan and Roman Furniture, Oxford, 1926, p. 137ff. 6 G.M.A. Richter, The Sculpture and the Sculptors of the Greeks, New Haven, CT, 1929, fig. 334. 7 V. Spinazzola, Le Arti Decorative in Pompei e nel Museo Nazionale di Napoli, Milano, 1928, pls. 34ff. 8 See reliefs nos. 948, 'Satyr, Maenad'; 1014, over the main interior door of the long gallery. Rome; collected in Rome by Charles Heathcote Tatham for the architect Henry Holland during the 1790s. See Cornelius Vermeule, unpublished catalogue of the Antiquities at Sir John Soane's Museum, Introduction, transcription of Tatham letters, List 2, no.43. Tatham: Etchings, 1; Drawings 3A. A. Michaelis, Ancient Marbles in Great Britain, trans. C.A.M Fennell, Cambridge 1882, p.481, no.37. Description of Sir John Soane's Museum, 1930, p.80.